The Etienne Autumn Leaves Cloisonne Urn is hand-crafted using an intricate and ancient metalworking process with multiple layers of fired enamel over copper or brass. Because the pattern and coloring on each urn is done by hand, the design and color will vary just a bit from urn to urn, making every urn an individual work of art. This urn loads easily through the top which is secured with a threaded lid. Wood base is included with Urn. Also available: The matching keepsake and Heart Keepsake. 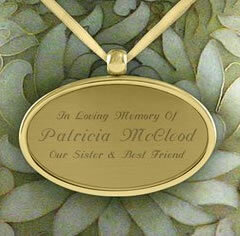 Engraving: Engraved Pendant is available. (See Photo). Please limit engraving to no more than 30 spaces per line. Please allow one business day for engraving before item ships.